Every year tens of thousands of dogs are inhumanely transported from Thailand to neighboring countries where they are butchered by cruel and barbaric methods. We need to STOP the Dog Meat Trade Now! In 2014 the founder of Pattaya Animal Coalition is running 999 KM cross Thailand visiting dog shelters and activist to raise awareness and funds to end the DOG MEAT TRADE. Thanks to Soi Dog and AAA many arrests were made in the north-eastern province of Nakhom Phanom Thailand with thousands of dogs rescued from from tiny cages. 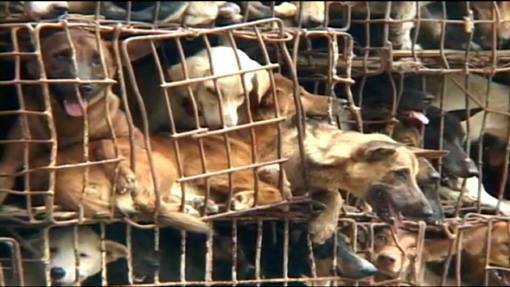 These dogs, stacked high in metal cages and being transported to Vietnam for slaughter and consumption. Many hundreds die of suffocation in the cramped cages each year. This is a daily operation and we need it to STOP NOW. The Thailand Run main have created PAC – Pattaya Animal Coalition and together with Soi Dog and others like AAA Thailand want to raise money to Stop the Dog Meat Trade and help the dogs already in shelters.Pattaya is lacking a proper shelter and PAC hoping with your to help establish a adoption and care center in the Pattaya area similar to the Soi Dog in Bangkok. 35 to 40 tons of food are required each and every month to feed the hungry dogs at the four shelters in which rescued dogs are housed. The Cost per shelter (500 dog capacity) is around $40,000 but we hope to raise more than that with YOUR help. This campaign is part of the 999 KM Thailand Charity Run 2014.